Nothing says “Kids Live Here” better than a paper chain garland around your Christmas tree. (Except maybe sticky jelly fingerprints on your walls.) If you’ve never had the pleasure of creating one of these—either as a child or as a parent—this is your year! Not only do we have super simple instructions for how to make a paper chain, we also have downloadable printables you can use to create this family-friendly Christmas craft. Build your chain out of the fronts of recycled Christmas cards. Also, cut a strip out of the signed inside of the card and add it to the chain. 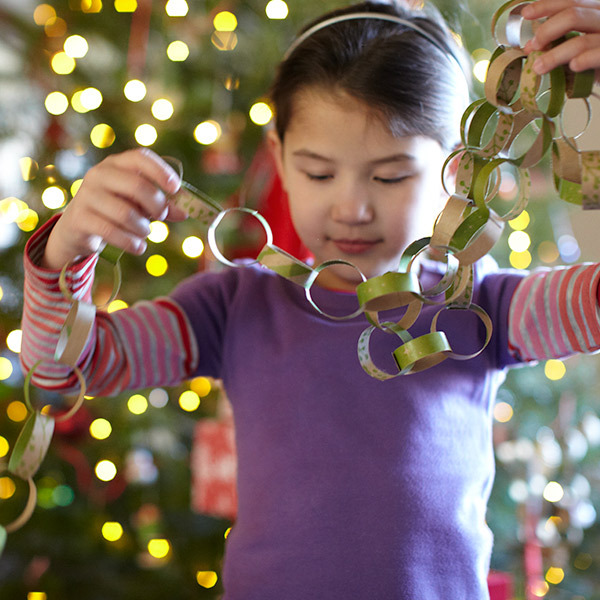 Make a countdown chain by adding a number and a Christmas activity to do written on each chain link. Then, each day, pull off one of the links and do the activity listed. Decorate your chains with favorite Christmas song titles, lyrics, book quotes, scripture or even wish-list items. Next year, It’ll be fun to look back to see what each member of the family considered important then. Use pinking shears or scalloped-edge scissors when cutting the strips for extra decoration. Or use gift-wrap, old sheets of music or newspaper.